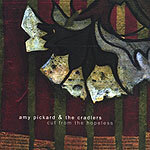 CD review: "Cut From the Hopeless"
What a remarkable treasure this CD from Amy Pickard is  she found us on MySpace and asked if she could send us her CD. Beautifully combining lovely songs with exquisite lyrical poetry to as gorgeous a singing voice as exists, Pickard's debut is a seamless melding of jazz-styled singing atop bluegrass playing. Making it as close to musical perfection as exists, those remarkable songs and lovely voice are backed by a stripped-down but perfectly arranged traditional band. Amy Pickard is an undiscovered treasure for all but those lucky Philly music fans who get to check her out in person and those who have found her CD. Think Norah Jones sitting in with Alison Krauss' band and you get sort of a feel for the flavor of this release.